Craft stores have a very big variety of wicker baskets of all shapes. You can also find great buys at garage sales or thrift stores. I have found some really great baskets and then brought them home and made them look completely different. All you need for the transformation is a basket and some acrylic paint. The basket pictured here wasnâ€™t very pretty when I bought it so I got busy with my paints. Give me a bottle of paint and I can fix just about anything. 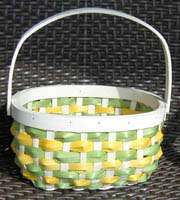 This basket was painted with pastel green and yellow acrylic paints. It now looks like Spring and works great for Easter. I have painted baskets in various colors depending on the season. Red and green work great for the Christmas season and with poinsettias they look beautiful. A poinsettia Christmas Basket can really set the tone for your Christmas table. They are so pretty and the best thing is that they will last from year to year. There are times that you need to have a gift basket for baby showers, bridal showers or house warming gifts. What a great way to give a gift and then they still have the basket to use. I have seen baby shower baskets that are so cute. You just need to paint them with pink or blue if they know what the baby is going to be. If they don't then just paint them yellow. Why not make a cute basket for a child for Halloween! They can use them year after year and that will save you money right there. The next time you go to a garage sale or thrift store look at their baskets. You can find some great bargains and all you need is some paint to make them like new. Just have fun and experiment with different colors and types of baskets. If you have any questions or arts and crafts that you would like to share please contact me and I will add your idea.